Bathroom Fan and Venting Advice. Stop the dripping. The main problem, our bathroom exhaust fan drips in the winter! 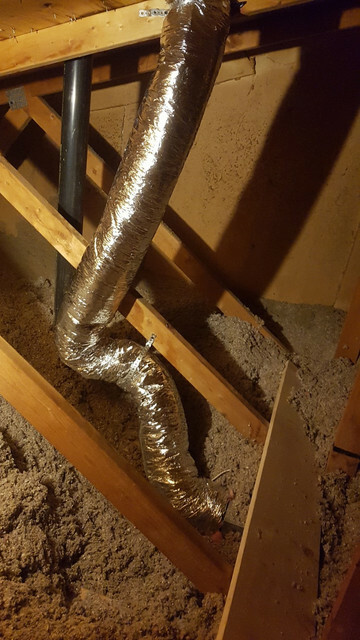 The duct inside the attic is insulated flex duct, it is quite long though. There is about 2 feet of the duct coiled up at the base of the fan. So I know that is one problem that needs to be resolved. Should I just cut the duct so that it is the correct length, or would it be better to replace it with insulated rigid duct? Our other issue, I'm not sure that the fan is able to push enough air out of the bathroom. It is a small bathroom, about 6' x 10', the fan is 80cfm, but there is no vent from our HVAC system going into the bathroom. I'm thinking that if I were to cut a hole in the bathroom door and put on a return air vent cover, that might improve airflow coming into the bathroom and allow the fan to move more air. Any thoughts on if this would improve the situation? Re: Bathroom Fan and Venting Advice. Stop the dripping. Most bath fans loose volume if they have to push further then 10’-12’, you never said exactly how far you are pushing? If you are pushing that far or less then your fan should do it , if you are going further then you should change to a 110cfm fan to help compensate for the extra distance. Also the cooled up extra venting is not helping. The vent should have either a slope running away from the fan or a drop that acts as a kind of a trap to prevent moisture from running back . If the run is much over 16’ then ridged insulated pipe would be better then the flex pipe. Now for the fan to properly ventilate you also need at least 3:4” gap under the door to help with having enough air flow. Adding the vent in most cases should not be necessary. You probably already figured it out, just in case, I think what Shannon meant with the door gap is 3/4". Your lack of source air is probably exacerbating the problem of condensation, since the fan cannot push enough air to vent the warm moist air before it condenses within the pipe. A larger capacity fan would also help to vent the air before it can condense. The exhaust tube should only be as long as it needs to be and as straight as possible, anything else just introduces resistance that the fan has to overcome. Trim the length down and include a droop in the tubing as a condensation catch. I would put the droop as close to the fan as possible, even if you have to do a little hump at the fan to get a droopy section. Definitely keep it insulated! I would make changes one at a time until you get the results you're looking for. Definitely start with altering the exhaust tube and cut the bottom of the door so that you have 3/4" gap. If this doesn't do the trick, think about upgrading the fan CFM. Spruce is correct the more changes in direction in the ducting reduces the air flow But in colder climates where the vent travels vertically through the roof you need to create a trap for moisture exactly like what you have in the illustration . In colder climates during winter that warm moist air condensates so quickly we need to trap it before it runs back into fan and out onto bath floor. The condensation does freeze in that trap during winter so you need the strap to be able to hold the weight as it grows over time. When we get some hotter days and the attic warms up in winter it will usually evaporate some of that moisture as well. With straight horizontal runs we simply slope the ducting towards the exterior vent and we have no troubles. I spent the afternoon up in the attic, unfortunately I found a couple more issues. I ended up just replacing the whole flex pipe with a new one. The insulation layer was soaked through from the condensation. The connection to the roof vent wasn't right. The top of the flex pipe was just stapled over a hole in the roof sheathing. I ended up shoving a piece of 4 inch duct through, with a cutout on the side of the vent grille. Sealed around the edges of the hole with silicone, then connected my new flex pipe to the 4 inch duct. Thanks for all your help, and love your channel. Your advice has really helped for a few projects including finishing our basement. Looks like that should work. Glad you like our channel and forum! If you find you need a larger trap, install a larger fan AND increase the trap by elevating the entry of the trap more. The air is hottest right at the fan, so the closer you put that raised element, the better because most of the condensation is going to happen near the outlet of the vent tube where the exhaust air is coolest. I would also recommend installing a timer switch on the fan, that way you're not unnecessarily running the fan and venting conditioned air out of the house, not such a big deal in the summer, but in the winter it can really affect your heating bill.